Kate Spade. Anthony Bourdain. The news hit all of us hard. Maybe for some of us, this news feels like a punch in the gut because we experience these feelings or we love someone that does. Suicide ideation and suicide completion may be hard for some to understand. We want simple answers from a toxicology to suggest drugs or alcohol were involved. This gives us a sense of feeling like “it won’t be us.” We want revelations of a dark secret because if we don’t have skeletons in our closet, maybe we will be insulated from suicide. We want to think that maybe it’s a problem of the wealthy or perhaps the glare of the spotlight brings it on. We want to think that it can’t happen to us our our loved ones. Our story doesn’t have fame or fortune, nor a drug user, or any dark secrets. Our story started when Oliver just turned five. Our sweet lovable child shared things with us when he was distressed that made tears fill our eyes and lumps form in our throats. I’ve never told this story in this way. I’ve thought about it, but thought this was his story to share. I’ll let him share his story when he’s ready and if he decides to; but what I will do, is tell you a few things that we did when Oli expressed suicide ideation. We talked to people about it. We decided that we were not gonna be embarrassed or afraid to share what our family was going through. We were gonna let our people in. We told friends and family, his teachers, caregiver, and our colleagues. We were worried, certainly, but I was also aware that these are the secrets people keep and they are dangerous secrets to keep. If we can have open conversations about our struggles, we will be able to feel the support of those in our lives. We wanted both of our children that there is nothing shameful about talking about mental health. So, we talked and people listened. We allowed people to ask us for updates and show their support and love. We also were not shy about telling people what actions were were taking, how we were talking to our children. This is how we de-stigmatize mental health concerns. Even though I’m a therapist, I knew we needed support. We wanted to try natural and environmental changes prior to pharmacological supports. We were not opposed to medically managing his symptoms; just wanted to explore first-line solutions that didn’t involve medication. As a family, we went to a psychiatrist. We selected a person that we trusted, that would listen to us and wouldn’t shame or blame us. We selected someone that would see education as what she believed was best for our child, but at the end of the day respect our decisions. We did a Genomind panel that gave us a ton of information about how Oli would respond to each type of medication and a bit of information about his genetic makeup. We wanted as much information, so that in the event that we decided pharmacological supports would be a reasonable solution, we might be able to avoid the trail and error. We wanted to have all this information well before we made a knee-jerk reaction to fill a prescription. We learned that Oli’s body did absorb folic acid. He also might benefit from fish oil. He definitely had dysregulated sleep patterns. We started Oli on meta-folate, fish oil and a small dose of melatonin. We regulated his sleep within two months and he no longer takes this supplement. We continue with the fish oil and vitamins. We see a difference. From the Genomind results, it was determined that Oli carried a gene that increased his anxiety if he didn’t vigorously exercise daily. We knew Oli benefited from movement, we saw changes in self-regulation when he swam. Yet, we were busy people and sometimes we didn’t put this into our lives. Our first life change—we made movement part of each and every day. We jumped on our trampoline, we hiked, we let him bring his skateboard into the house. We took him surfing far more regularly. We took him to running club every day. During this time, I had taken some courses on animal-human connection. We could see that Oli was both comforted and comforting to animals. We had no intention of being dog people just yet, but we knew that this was what he needed. We found the right breed for our family and we added our sweet golden retriever, Brucey to our family about a month ago. Although Oli had been without suicidal ideation for a few months, we noticed that he continued to have self-regulation issues. When we brought Brucey in to our home, we saw a substantial shift. He noticed it too. I recently asked him if he felt different since we got Brucey and he said, “I just feel happier.” I agree, I think we all are. We knew that we didn’t want to over-focus on his problems, making him feel like something was wrong with him. Personally, I checked in with myself and noticed that adventure was missing from my life. I had previously loved adventuring. I had started to believe that having young children precluded you from adventure. When I noticed this, I made a shift. We decided to take a surf trip to Nicaragua. It was exactly what we needed. I participated in a Rising Strong workshop and worked on my own fears and shame around this experience. I introduced my children to how personal values guide our lives and we selected our values. We talked about self-compassion, oxytocin, and use tons of emotional language. We allow all feelings to be part of our home. We didn’t always have the patience, the right about of empathy, the energy to follow through on what we knew worked for our child, or the ability to discuss it between us parents. We also didn’t always agree on what to do. Sometimes it felt overwhelming. Sometimes, I let fear get in my way. Sometimes I felt to tired to exercise with him and sometimes I just wanted to be easier. If you or someone you know is struggling with suicidal thoughts, understand that you are not alone. 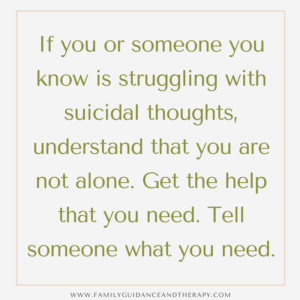 Get the help that you need. Tell someone what you need, if you can’t activate your own supports. This was what we did. It may not be what works for you. What I know is that suicidal ideation is something that can occur for all people at any age or stage. I also know that it can get better.